Contributed by Jonathan Stevenson / David Hockney, in Randall Wright’s rather breezy documentary Hockney (at Film Society of Lincoln Center, extended through June 2), appears to be a thoughtful hedonist, in thrall to beautiful moments. He admits to a fairly happy working-class childhood in Yorkshire and seems to have encountered relatively little friction over his emerging homosexuality. The film chronicles more or less linear progress as an artist and the usual personal angst that arises from soured romance and inevitable aging. The only major cloud in the film – in which Hockney himself appears and over which he reportedly exercised some control – is the scourge of AIDS in the 1980s, which indeed hollowed out art communities. Still working at an apparently healthy 78, he will have lived a generous life and enjoyed longstanding esteem. Tonally, Hockney is a picaresque stroll through an artist’s life, and offers sound tutorials and insights about his work. Hockney’s version of Pop Art at first centered on surfaces and human interaction. Later, though, he became more interested in visual perception, prodding the viewer to step inside the picture plane and extrapolate the image’s vanishing point with a seductive sense of line, color, and composition that yielded a kind of sublime blitheness. David Hockney, Peter Getting Out of Nick’s Pool, 1966. Photograph: David Hockney Collection, Walker Art Gallery, Liverpool/Richard Schmidt. By the documentary’s lights, Hockney has a resolutely positive outlook on life, barely registering on the spectrum of negativity and foreboding. This assessment may be a little too glancing. 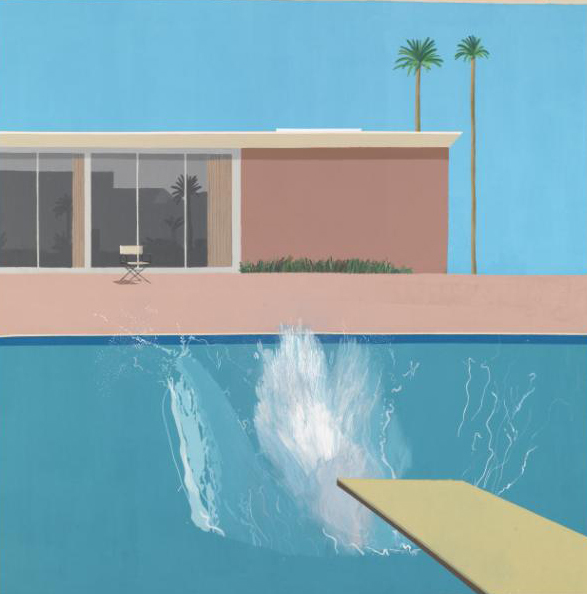 Luca Guadagnino’s recent suspense movie A Bigger Splash, named after Hockney’s large and celebrated painting of the same title depicting the instant after a dive into a swimming pool, suggests the darker perils that Hockney-esque idylls may hold. In any case, Hockney’s paintings are not merely nice to look at. In his unambiguous and unashamed references to gayness, he was ahead of his time. Hockney, 2014, directed by Randall Wright. Film Society of Lincoln Center extended through June 2, 2016.